Monday - Thursday 10:00 am to 3:00 p.m. Send orders Sapulpa Historical Society, P. O. Box 278, Sapulpa, OK 74067 and include $3.00 per book for postage and handling. 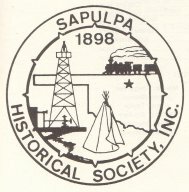 Sapulpa Historical Society Museum is an independent museum receiving no city, county, state or federal monies. The building located on Lee Street was once a hotel and the third floor housed the Business College from 1921-1925. The college moved east of there for a number of years before closing. 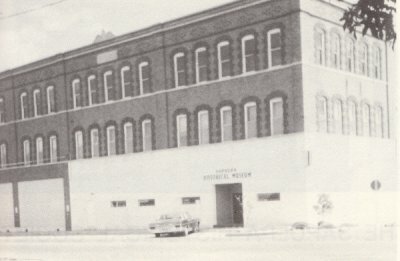 From 1930-1960's it was the YWCA which housed young ladies on the second floor. Various businesses have occupied the first floor. Many nostalgic artifacts are available for viewing which features the history and heritage of Sapulpa and the surrounding area of Creek County. Exhibits include Glenpool Oil Field, Frisco Railroad, Creek and Yuchi Indians, Brick Glass & Pottery Industries, 1890s Kitchen, Country Store and War Room.